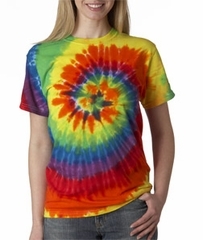 This Tie Dye T-shirt Rainbow Swirl Adult Tee features a classic stunning tie-dye design� �Rainbow Swirl! Our 100% cotton heavyweight shirt beautifully captures this timeless art making an all time favorite choice for every tie dye fan! Hand-dyed with superior color fastness! Unisex Sizes available in Small, Medium, Large, XL, 2XL & 3XL!